Krystian Nowak came on as a second-half substitute against West Brom. 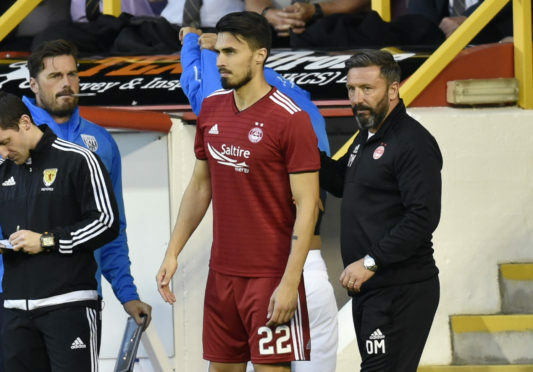 Derek McInnes will make a decision on whether to hand Krystian Nowak a contract in the next few days. Former Hearts defender Nowak has been on trial with Aberdeen for the last fortnight and McInnes is keen to strengthen his options at the back. The Dons have also taken Austrian goalkeeper Sebastian Gessl on trial after he was released by German outfit Karlsruhe. McInnes is in no hurry to bring in a new goalkeeper though. He added: “There’s no urgency for Thursday. In an ideal world it would be done but it’s more important to focus on the ones we’re trying to bring in outfield. We’ve got a very good goalkeeper in Joe Lewis and the loan deal allowed Danny (Rogers) to go out and play. We can recall him for the domestic games if required.